The specified file public://inline-images/https_%2F%2Fs3-us-west-2.amazonaws (4)_15.jpg could not be moved/copied because no file by that name exists. Please check that you supplied the correct filename. The specified file public://inline-images/https_%2F%2Fs3-us-west-2.amazonaws (9)_6.jpg could not be moved/copied because no file by that name exists. Please check that you supplied the correct filename. The specified file public://inline-images/https_%2F%2Fs3-us-west-2.amazonaws (10)_4.jpg could not be moved/copied because no file by that name exists. Please check that you supplied the correct filename. 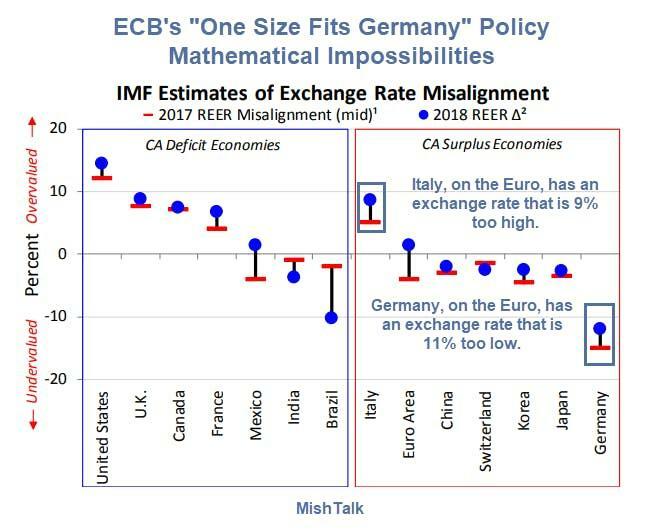 "One Size Fits Germany"-Math Impossibility: Mish Warns "Get Your Money Out Of Italy Now!" Italy, on the Euro, has a currency that is 9% too high. Germany, on the Euro, has a currency that is 11% too low. There was much discussion last week about the US Treasury report that determined China was not a currency manipulator. However, there are six countries on the manipulation watch list: China, Japan, Korea, India, Germany, and Switzerland. Japan, Germany, and Korea have met two of the three criteria in every Report since the April 2016 Report having material current account surpluses combined with significant bilateral trade surpluses with the United States. Germany has the world’s largest current account surplus in nominal dollar terms, $329 billion over the four quarters through June 2018, which represented its highest nominal level on record. Germany also maintains a sizable bilateral goods trade surplus with the United States, at $67 billion over the four quarters through June 2018. There has been essentially no progress in reducing either the massive current account surplus or the large bilateral trade imbalance with the United States in recent years, in part because domestic demand in Germany has not been sufficiently strong to facilitate external rebalancing and because Germany’s low inflation rate has contributed to a weak real effective exchange rate. In theory, German, Italian, and Greek 10-year bonds should all have the same yield. In practice, they clearly don't. The spread between German 10-year and Italian 10-year bonds is 330 basis points (3.3 percentage points). The difference is perceived default risk. The odds of Italy leaving the Eurozone are rising. 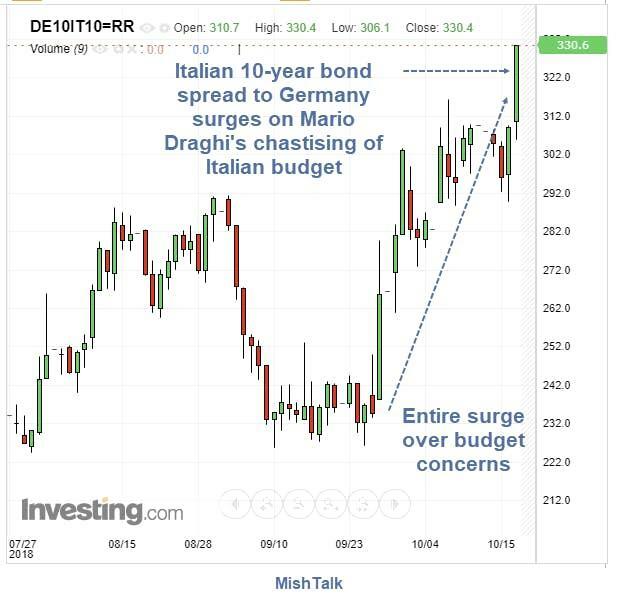 On September 28, Italy's proposed budget deficit of 2.4% sent bond yields soaring. And they haven't stopped. Today, ECB president Mario Draghi warned "Undermining EU budget rules carries high price for all" and yields surged again. For discussion, please see Italy Bond Yields Surge In Confrontation with ECB President Mario Draghi. Italian bonds are just two steps above Junk. Again, this should not happen "in theory". All Eurozone sovereign debt should have similar ratings. Practice is another matter, as Goldman Sees Italy Junk Risk Leading to ‘Sudden Stop’ of Capital. Capital flight is already underway. 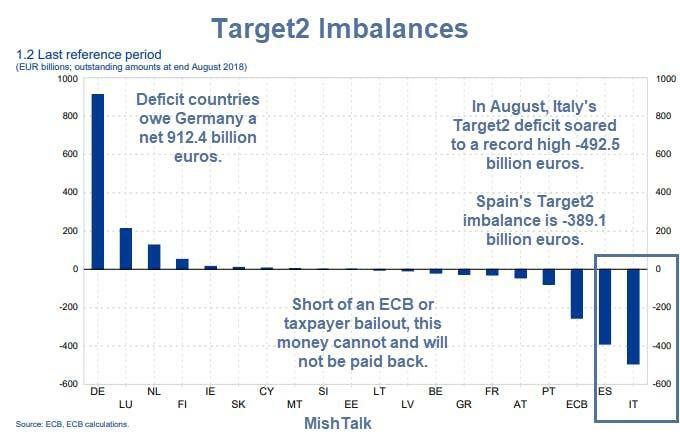 Proof can be found in Target2 Imbalances. Zerohedge reports More Italians Move Savings to Switzerland as Fears of Banking "Doom Loop" Intensify. With the euro weakening against the Swiss franc and Italian stocks and bonds tumbling once again on reports that the European Commission is planning to reject the Italian draft budget plan submitted earlier this week - a repudiation of Italy's populist leaders that was widely anticipated - the Telegraph's Ambrose Evans-Pritchard offered a glimpse into how middle-class Italians are reacting to the deteriorating relationship between Italy and the EU, and its attendant impact on the country's banks and capital markets. In a trend that's eerily reminiscent of the banking run that precipitated the near-collapse of the Greek banking system (most recently in 2015), Italians are scrambling to convert their euros into Swiss francs and stash them across the country's northern border with Switzerland. The Swiss group Albacore Wealth Management told Italy's Il Sole had received a wave of inquiries from Italians with €5m to €10m in liquid capital. The super-rich are already a step ahead. "The big fish have been organizing the expatriation of their wealth for some time," it said. "There is fear creeping in," said Massimo Gionso, head of family wealth managers CFO Sim in Milan. "People are concerned that if we get into the same situation as Greece, they might find the banks are closed and they can take out only €50 a day from cash machines. They don’t want to risk it," he told the Daily Telegraph. "These are families with savings of €200,000 or €300,000. They want to set up accounts in Lugano or Chiasso across the border in Ticino where everybody speaks Italian. The big players have already got their money out," he said. How Much Money Is Leaving? Between July and August, Italy's Target2 imbalance rose by 21.4 billion euros. That was before these budget concerns became apparent. The ECB's interest rate policy, was fatally flawed from inception. German productivity vs peripheral Eurozone productivity is yet another issue. EU policies take all 27 nations to agree, or nothing gets done. So the broader EU is fatally flawed as well. These flaws were generally recognized actually. So were problems with Greece. Yet, they welcomed Greece with open arms. The global economy is slowing, Trump's trade polices are wreaking havoc and Brexit is going to damage trade ralations as well. We have had a 10-year recovery, yet the ECB is still expanding its balance sheet. The ECB is supposedly going to cease those asset purchases in 2019.
Who will buy Italian bonds, and at what price? And what about the Italian bond inevitable downgrade to junk? If you have money in Italian banks, get it out now, while you can. Capital controls are coming and Italy is increasingly likely to leave the Eurozone entirely.